I am "building" a 49 two door brougham from a pile of junk. I plan to use a 262 with a Hydr-Matic. I have a 51 donar car for the cross member and floor board. I think I read a thread about this a long time ago, but couldn't find anything on a search. It looks like an easy and cheap ..conversion..To put a GM V6 throttle body on a stepdown six. A whole used car could be bought for what the aftermarket stuff would cost.. Considering I will have 12 volts.And my labor is cheap! I have often reasoned that this should be possible with a simple system from a 6 cylinder motor.I dont think I know enough about modern cars to do it . But what you talk about seems to be possible. There is allready electronics for the point replacement that is easily obtainable. Whats the big thing a modern motor has that the old engine would not? The throttle body of course , O2 sensor ,MAP sensor ,crank shaft sensor ,and a brain or moddule ? All of that as you say would be on the "Donor" car. I would think the most difficult thing would be placing the sensors in the right place. Ive thought about TBI too but always had couple other Projects going.. I researched a bit once to learn it wouldnt be that difficult using a Chevy TBI now that a Chevy 6 Cyl Distributor from Ron Fellows in Texas can be adapted to Trigger he Unit. I wish someone would persue the Project. What about the Ford 300 straight 6 EFI factory setup? Many moons back Jack Clifford offered a TBI setup. The TBI fit on his 4 brl manifold and he used an after market computer adjustable kit Don't recall if it was an Accell or Holly unit. Of course it would require 12volts , electric fuel pump and a fuel return line. I had the info on it a long time ago but unfortunately I can no longer find it. He also had in the works at that time a manifold for port fuel injection. TBI set up was good for 15% increase in power and the port system was rated at 25%. Anyone else remember these? Jack sent me the info back about 1989 When I was chapter president. 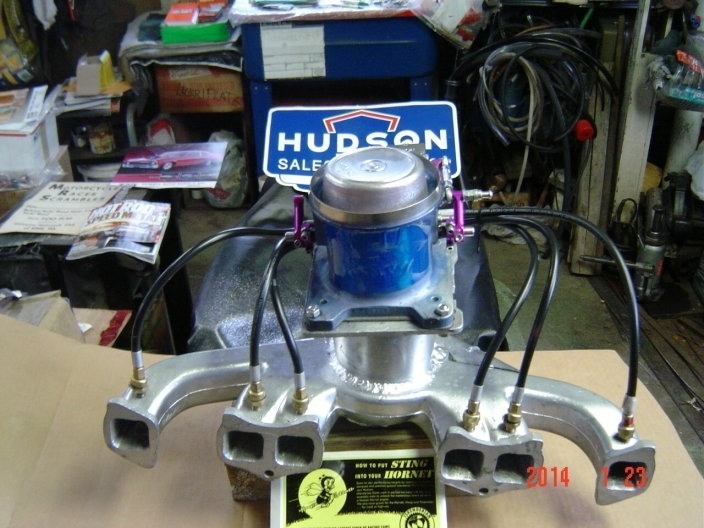 Uncommon Engineering has pictures of a Twin H setup converted to efi. Might be multi port with the carbs now acting simply as the throttle bodies. Plenty of TBI kits out there now to bolt anywhere a 4-bbl or 2-bbl was. It would be pretty easy. I was planning on going this route before I had to sell my car. You could use a chevy six cylinder TBI ecm and all sensors, if you are willing to do your own wiring and parts scrounging you could do this for a few hundred bucks, if not it be much more expensive. You could even forgo the electronic timing for a while if you needed to save money. If you have any questions let me know and I will see if I can help you with them. Bill@hamiltonfuelinjection.com has already done this and has kits he has made available for Hudsons. He even is running a Twin H FI. These are from GM 6cyl. He posts hear occasionally.